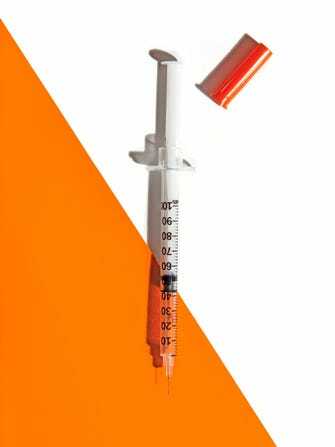 Every single day, there appears to be some cosmetic injection that promises a wondrous beauty fix. Fillers and muscle paralyzers are the name of the game and many a selfie-taking maven has indulged in the practice. Well, if your neck is bothering you (and we mean the neck fat that causes a double chin, not the actual neck), there's a new injectable awaiting FDA approval that promises to help: ATX-101. The injectable, which is in late-stage approvals, works by dissolving subcutaneous fat in the neck area while leaving the muscle around it, to quote Kythera, the company that makes the injectable, "largely unaffected." We put a call out to renowned plastic surgeon and injectables expert Dr. Frederic Brandt for a little more information about the drug. "It is a deoxycholate detergent that kills fat cells, creates an inflammatory action, and helps create tightening of skin," says Dr. Brandt. "We've been in FDA trials for the last several years; it's used for submental (under the chin) fat." Do yourself a favor and do NOT Google image search that — you will not like what you see. According to Dr. Brandt, depending on the patient, about 20 injections can be expected on average per treatment, and multiple treatments would be needed to see results. You can expect about a week of swelling and redness from each individual session. As far as side effects go, Dr. Brandt says it is a "very safe procedure, but we'll have to wait until studies come out to discuss anything further." Fair enough. According to the company's website, in six years of clinical trials, there have been over 1,600 test patients treated "with more than 90% of patients...maintaining a meaningful reduction of the fat after two years." Jury's out on any potential side effects, but for those who have issues with a double chin, which can be caused by everything from weight gain to genetics — there appears there's a needle coming that can help tighten and reduce that issue without having to undergo painful surgery. And, for those of us not keen on having someone wield a knife around our necks, that's some very interesting news indeed. Would you get an injectable to tighten a double chin, or do you think this is way too creepy for words?